Flawless skin, check. Strong brows, check. Voluminous lashes, check. 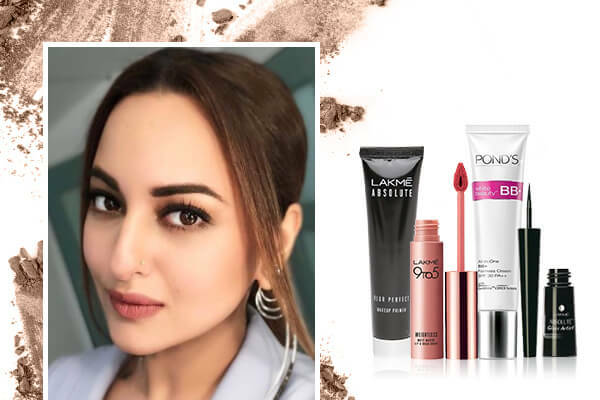 Sonakshi got almost every aspect of her makeup on point. This makeup look just goes to prove that a little goes a long way when it comes to makeup. 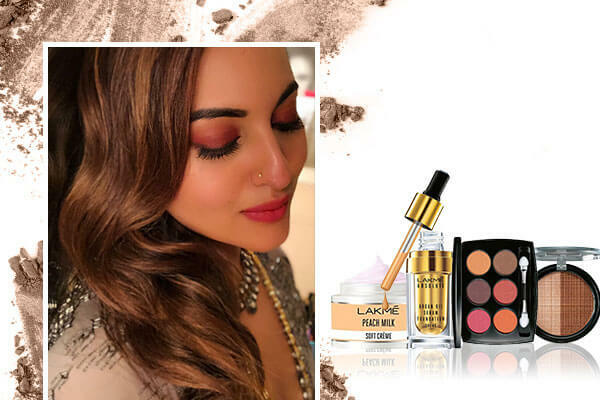 Step 1: For a flawless base, prep your skin with Lakmé Absolute Blur Perfect Makeup Primer that will help minimize your pores and double up as a smooth canvas for your makeup. Step 2: Even out your skin tone using the POND'S White Beauty SPF 30 Fairness BB Cream. Step 3: Line your eyes using the Lakmé Absolute Gloss Artist Eye Liner and finish off with LakméEyeconic Curling Mascara that will give you lengthy, voluminous lashes. Don’t skip the mascara as it’s the highlight of this makeup look. Step 4: Get thick yet natural looking brows just like Sonakshi’s by filling them appropriately! We love the Lakmé Absolute Precision Eye Artist Eyebrow Pencil for this. The thin tip will give you natural, hair-like strokes. Step 5: Finish the look using Lakmé 9 to 5 Weightless Matte Mousse Lip & Cheek Color in the shade Candy Floss. At the ‘Filmfare Glamour and Style Awards’, Sonakshi chose a rather toned down look – which is usually preferred to be a day look. But she decided to break the rules and let her outfit do all the talking with her soft, muted look. This look is great to take inspiration from in case you’re wearing an ultra blingy outfit and can’t figure out a way to balance your makeup with it. Step 1: Prep your skin using Lakmé Peach Milk Soft Crème Moisturiser that lends immense hydration to your skin without making it greasy. Step 2: Illuminate your skin using Lakmé Absolute Argan Oil Serum Foundation which helps you achieve a radiant complexion and a glow that lasts! Blend till it seamlessly disappears into your skin. Step 3: Go in for a sultry, mauve smokey eye using the Lakmé Absolute Illuminating Eye Shadow Palette in the shade French Rose. Step 4: Add to the glow of your skin by packing on some Lakmé Absolute Moonlit Highlighter on the highpoints of your cheeks. Step 5: You can either completely skip lipstick or add a slight tint of the shade that comes closest to your skin tone. What do you think about these two absolutely gorgeous looks sported by Sonakshi Sinha? They’re easy to do and look ultra glamourous, don’t you agree?